Traumatic or spontaneous tension pneumothorax is a potentially fatal event that requires immediate decompression. Currently recommended interventions for decompression are either needle thoracostomy or open finger thoracostomy [1, 2]. Needle thoracostomy is generally easier to learn, faster to perform and less invasive than surgical decompression. It therefore represents the preferred first line technique for many emergency providers and is recommended in several trauma guidelines [2, 3]. 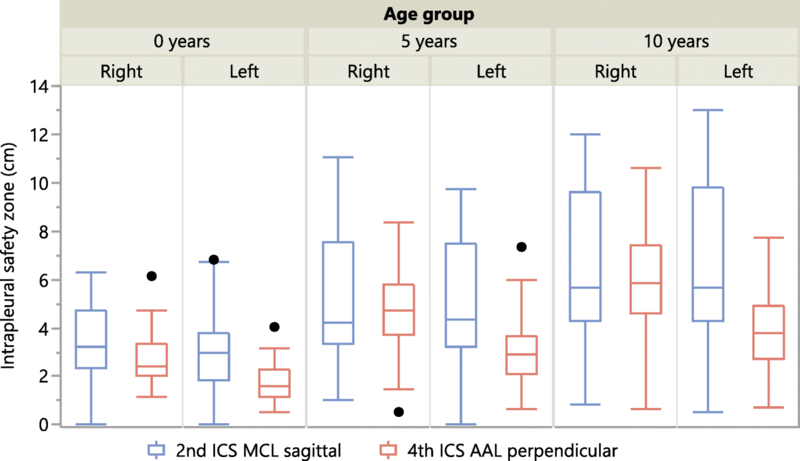 However, recent ATLS 10th edition guidelines suggest 4th/5th ICS mid-axillary line as preferable to 2nd ICS in adults and recommends same management for pneumothorax in children, except for needle or tube size. 2nd ICS MCL is still recommended as a possible insertion site in children . There is no reference in the APLS 6th edition on depth of insertion and it recommends 2nd ICS insertion site only . Commonly recommended puncture techniques are insertion sagittal to the chest wall at the 2nd intercostal space (ICS) in the midclavicular line (MCL) and perpendicular to the chest wall at the 4th or 5th ICS anterior axillary line (AAL) or midaxillary line (MAL). However, failed decompression is a commonly reported phenomenon in needle thoracostomy . 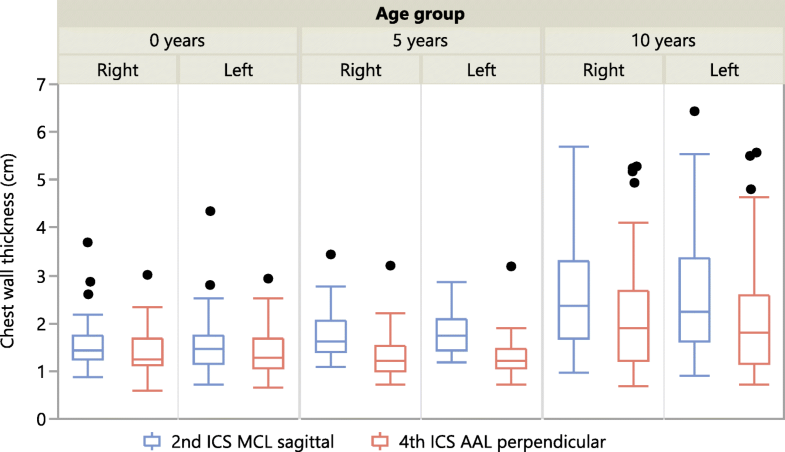 Therefore, in recent years, several studies examining chest wall thickness (CWT) at the recommended insertion sites have been conducted in adult patients and found commonly used cannulas being too short for successful decompression in a high proportion of patients . This has led to the recommendation of using longer 7-8 cm catheters for needle thoracostomy in adult patients [7–9]. Even though this increases the likelihood of successful decompression, it also increases the risk of injuring underlying vital structures like large intrathoracic vessels or the heart because of the possibility of deeper insertion . Due to the smaller anatomic structures, tension pneumothorax represents a particular challenge in paediatric patients. 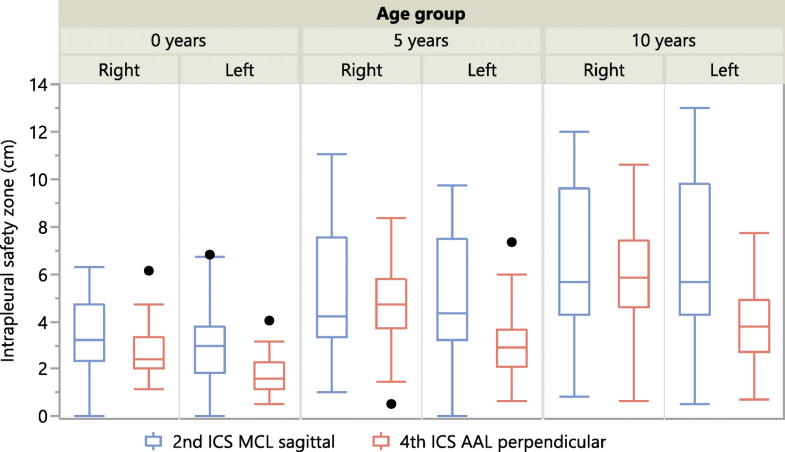 Open finger thoracostomy in the very narrow intercostal spaces in children requires smaller instruments and some surgical skills, which are often not available in the prehospital setting. Especially in small children it is accompanied by the risk of too large incisions with leakage of air along chest tubes. Furthermore, whilst the technique is similar to an adult, invasive paediatric critical procedures are often associated with cognitive hurdles and dissonance. Little is known about the required insertion depth of a needle for decompression in paediatrics or the likelihood of injuring underlying vital structures. Because of the narrow intercostal space, the risk of injury to the intercostal vessels and nerves has to be taken into consideration when performing needle decompression. 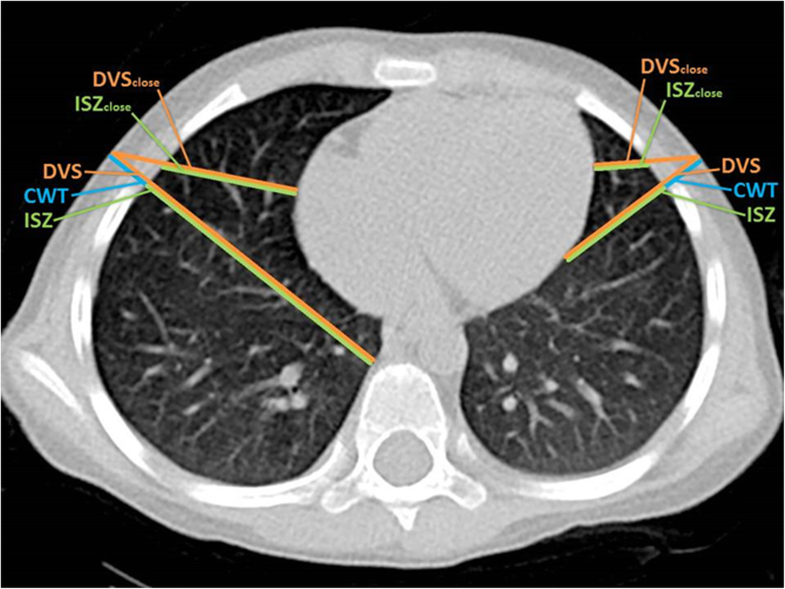 We aimed to evaluate the required depth for successful decompression, defined as the distance from skin to pleural space, whilst minimizing iatrogenic underlying structure injury.